Bristol Equestrian Estates, LLC is in no way endorsing or guaranteeing any of the items or transactions that occur from this page. We are merely offering the space for our boarders to utilize. All transactions are solely between the buyer and seller and BEE assumes no liability or responsibility. 15″ in good shape for work or show. Bridle, pads and girth included. Great saddle for Western dressage (for rider position). $750.00 all included. 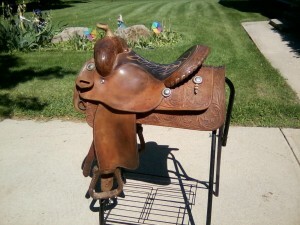 More photos available, contact letcinc@charter.net to see this saddle.